Over 5,328 Virginia members have taken 87,988 courses for 659,978 credits! The Virginia State Board of Public Accountancy does not maintain a formal CPE Sponsor program, which is the reason why no CPE sponsor has an approval number for Virginia. Instead, the Board has defined the requirements for acceptable CPE courses. All self study courses meet the requirements for Interactive Self Study (now simply known as self study courses) as defined by the NASBA / AICPA standards for self study CPE programs. 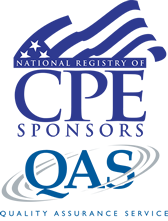 EAs and RTRPs in all 50 States can take courses for your license renewal on the CPE Depot site! Do you just need Ethics or a few more CPE credits? The CPE Depot website allows you to purchase individual courses. Browse our courses, purchase a course and start earning CPE credits immediately. All self study courses on the CPE Depot site meet the requirements for Interactive Self Study defined by the NASBA / AICPA standards for self study CPE programs. Try our sample course and discover how easy it to take courses on the CPE Depot website so you can start earning your CPE credits immediately. This course does not provide free CPE credits If you have a group of 5 or more individuals that need to complete their CPE credits, you can create a group plan and receive an even lower price per person.